MAH SING Group Bhd was probably the best-performing developer in terms of sales last year. However, the valuation of its shares isn’t up to par with its tier-one peers. That said, group managing director and group chief executive Tan Sri Leong Hoy Kum is proud that Mah Sing is the top pick of 12 stockbroking firms in town. He believes that the group will be able to replicate its stellar sales performance this year, despite tighter loan regulations and the possibility that a turn in sentiment will reduce buying interest in the property market. “Every year, there are about 200,000 new marriages but only 70,000 to 80,000 new homes are completed. We use marriages as an indicator of new household formation. Even if only half of them seek to buy a home, the market is still undersupplied,” Leong tells The Edge. Mah Sing’s (fundamental: 2.2; valuation: 2.4) meteoric rise as a property developer has been fuelled by its aggressively fast turnaround model, but it is also a point of concern for some investors. Despite booking a 15% increase in sales last year, the group is valued at a discount to its peers. As at last Friday’s close of RM1.91, the group is valued at 9.32 times earnings while its peers are trading at 12 to 14 times earnings. Leong declines to comment on the valuation of the group, but says out of 19 analyst calls, there are 14 “buy” calls on Mah Sing with 12 selecting the developer as their top pick for the sector. The other five calls are either “neutral” or “hold”. One reason for Mah Sing’s low valuation is its rising borrowings, according to some analysts. As at Sept 30, 2014, the group’s net debt stood at RM806.41 million, which works out to a gearing of 0.37 times. In contrast, its net gearing stood at 0.16 times at end-2013. Note that most of the debts are long-term obligations. However, the group will address its debts by undertaking a rights issue with warrants to raise RM629 million to bring its gearing down to a more manageable level. More importantly, it will use RM530 million of the proceeds to complete two acquisitions that were made last year — the RM359.6 million acquisition of a tract in Seremban and the RM656.9 million acquisition of a tract in Puchong. Post-exercise, the group’s net gearing should go down to around 0.2 times. 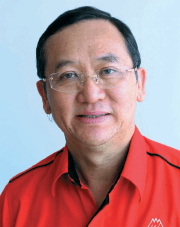 “We have RM5.1 billion in unbilled sales and together with our rights issue proceeds of about RM630 million, we will have a healthy balance sheet that will allow us to acquire more landbank for further expansion,” Leong says, adding that the group has 3,000 acres of landbank throughout the country. In fact, Mah Sing expects its net profit to grow 18% year on year in 2015 as booked-in sales are recognised, slightly lower than the 21% net profit growth recorded in the three quarters ended Sept 30 last year. Leong acknowledges that affordability will be an issue for homebuyers going forward, which is why the group is shifting its focus to mid-range products — units that cost less than RM1 million each. “We sell both mid-range and high-end products, just like Toyota also sells Lexus. As we anticipate more demand for products in the Toyota range, we will supply more of those. But that doesn’t mean we will stop selling Lexus,” he explains. Of the group’s residential property launches, 84% will be priced under RM1 million while 71% will cost less than RM700,000 and 44% will sell below RM500,000. Leong says Mah Sing will not compromise on the quality of its products or strip out “frills” and amenities from its developments in order to reduce its selling price. That said, developers in general are expected to see some pressure on their margins as they shift from high-end to mid-range products. But Leong says Mah Sing’s margins will remain intact. It doesn’t hurt that costs in general have come down. The plunge in oil prices should take the edge off transport costs while the slowdown in China and oversupply of raw materials have stabilised the cost of construction materials such as steel, says Leong. Internally, the group has also been actively undertaking cost-cutting measures to protect its margins, he reveals. Smaller developers that don’t have much landbank will not be able to bring down their selling price much since it has to reflect the cost of their land. By the time they react and acquire the land for more affordable projects, the bigger developers would have already saturated the market, Leong explains. In other words, the mid-range segment is going to see fierce competition from fewer developers, and mostly the big boys at that. Presently, Mah Sing is undertaking 48 projects nationwide, although 10 are close to completion. Leong says the group’s widespread projects that are located in almost all areas in the Klang Valley as well as Johor Baru, Penang and Sabah have helped it diversify its risk, and denies that the group is spread too thin. “We are coping very well with the projects that are in place and have the necessary resources to deliver quality products,” he says. More importantly, Leong points out that the group continues to see encouraging take-up rates heading into the implementation of the Goods and Services Tax on April 1. Leong shrugged off concerns about the GST, noting that most developers have already begun to price in the value-added tax. In fact, he expects the adjustment period to be less than three months. “We have enough landbank to last us 8 to 10 years, with a gross development value of RM66 billion. I am confident in our prospects this year, and we are participating in all the major property fairs, taking up the biggest booths. We are also maintaining our advertising expenditure,” he says. Note: The Edge Research’s fundamental score reflects a company’s profitability and balance sheet strength, calculated based on historical numbers. The valuation score determines if a stock is attractively valued or not, also based on historical numbers. A score of 3 suggests strong fundamentals and attractive valuations.